If you’ve been teaching graphic novels, or if you’ve been exploring graphic novel titles to teach, you’ve come across the books of First Second Publishing. They have been putting out amazing titles for all ages for years. Actually, it is their 10-year anniversary! Since I’ve been such a big fan of the publisher, I’ve decided to review five First Second titles over the month of February: my anniversary gift. I will kick off my month of First Second reviews with The Stratford Zoo Midnight Review Presents: Macbeth, written by Ian Lendler. 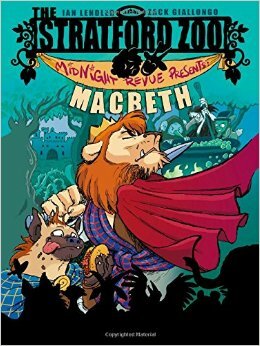 The graphic novel tells the tale of zoo animals that perform the classic story of Macbeth after hours when everyone has left the zoo, with the exception of some zoo keepers that stroll the grounds (causing the plays’ only intermission). 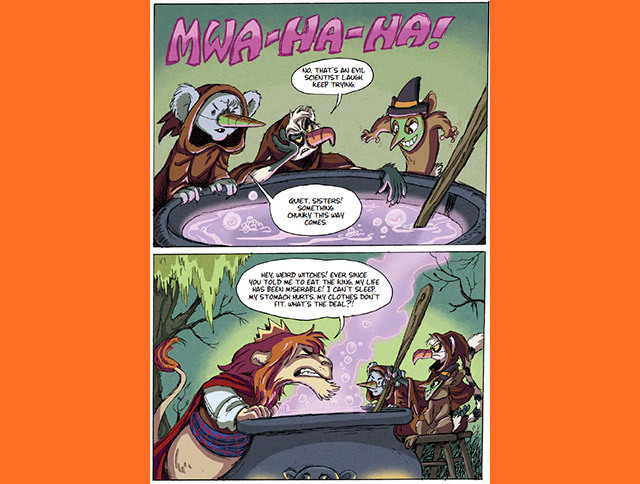 Macbeth and Lady Macbeth are lions, and all heck breaks loose as they decide it best to “eat” their problems. The witches are silly animals with masks attempting to perfect their “witch cackles,” and the animal audience is very active in the book, cracking jokes about the performance, and explaining more difficult vocabulary such as “conscience” to the reader, very reminiscent of a Lemony Snicket. I’m in the process of directing a 30-minute version of Macbeth right now, so the timing of it all is serendipitous. After receiving the book, I flipped through the pages to quickly realize that the language is not Shakespearean, and the book is fairly short at 74 pages; however, once I began reading it, I quickly understood that the adaptation is nothing short of fantastic story-telling. Immediately after reading it, I decided to introduce my Macbeth cast to the story with this graphic novel. My co-director and I brought our cast into a classroom and proceeded to do a dramatic reading of the graphic novel as we showed the illustrations on the overhead projector. Within twenty-five minutes, we were done, and the students had a solid working understanding of Macbeth. This is the first reason why the book is great: while it lacks the Shakespearean weight of language, it makes up for it in its simplicity of story-telling. I’d be willing to bet that this book would make a fantastic entryway into Shakespeare for the eager 5th, 6th, or 7th grade student. The book is honestly funny with laughs for all ages, and while I’d say this book would work best with younger students, the images and writing are cleaver enough for any adult to enjoy as well. The art, drawn by Zack Giallongo and colored by Alisa Harris, not only helps in adding to the humor, but also helps in the telling of the story, using large panels (including many full-page), and bold/contrasting colors to allow the reader to get very detailed windows into this world. There is also a Romeo & Juliet from the Stratford Zoo (published by First Second), and I’m excited to read it! I’m a fan, and if you are a grammar school or middle school teacher looking to get kids excited about Shakespeare, start here. I’m excited to review move First Second books this month…stay tuned! And remember to head to First Second to check out their library of titles.